Latin : Neonectria faginata (Lohman et al.) Castl. Monitoring must be ongoing in order to permit early detection of the arrival of the beech scale insect (Cryptococcus fagisuga Lindinger) and the fungus Neonectria faginata (Lohman et al.) Castl. It is also useful for locating healthy beech and those affected only slightly by the scale insect. Adequate stem density, use of a harvesting system that protects the roots from injury, stands with a diverse species composition, and the presence of beech with smooth bark are all factors that can help to prevent scale infestations and subsequent infection by Nectria sp. (Burns and Houston 1987; Davis and Meyer 2004). Before initiating silvicultural treatments to minimize the impact of beech bark disease in a stand, a variety of factors must be taken into consideration. Besides the age, size and vigour of the trees, it is important to consider species composition and tree density within the stand (McCullough et al. 2005). The first step is to carefully assess the health status of the stand. Actions should not be planned unless the condition of the stand makes them necessary. The goal of every management intervention should be to enhance the overall health of the stand (Burns and Houston 1987). The treatment that is prescribed will depend on the results of this analysis. The management standards discussed below have been abridged. A professional forester should be consulted before any interventions are initiated.Several management situations may exist: 1) the stand is healthy and free of both beech scale and the fungus, 2) the stand is infested with beech scale but no fungi, and 3) the stand has both beech scale and fungi and tree mortality is evident. 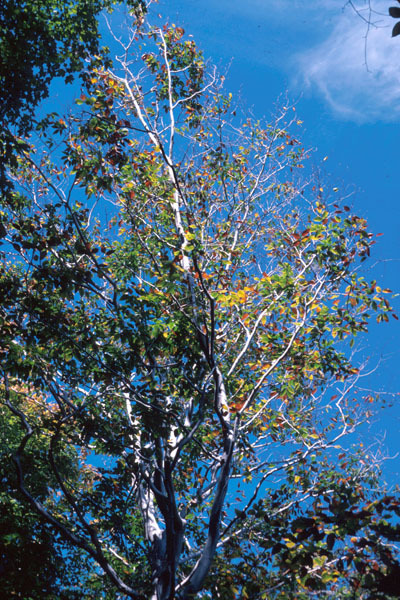 In the first two cases, the stands are highly vulnerable to the disease, particularly if beech are dominant. Large overstory beech in poor condition should be cut down, especially if the bark is damaged, even before mortality is observed. The goal of these interventions is to reduce the number of large, dominant beech and increase tree species diversity to lessen the impact of the disease once it reaches the stand (Heyd 2004). Transporting of wood should be limited to prevent the spread of beech bark disease. Ideally, wood should be transported in winter. Natural regeneration should be controlled to minimize beech regeneration and favour other species (McCullough et al. 2005). Healthy beech with few or no beech scale insects should be identified and protected (Heyd 2004). Most of these healthy trees are likely to have smooth bark that is free of crevices and other defects that provide sites for beech scale establishment (Burns and Houston 1987). These trees should be preserved by maintaining protective trees around them that will buffer them against stressors (Farrar and Ostrofsky 2006). After the disease has run its course (i.e., the killing front has passed) and the site returns to a stable state, natural regeneration will become established. Nonetheless, planting of trees may be necessary if the forest has been severely affected and if one of the management aims is to increase the diversity of tree species within the stand. Some beech trees occur singly in parks and on private property. When trees like this are infested with beech scale but not Nectria, treatment often consists in removing the wool-like wax secreted by the scale insects using soap, either manually or with a power washer. It is important to treat the bark with care (Davis and Meyer 2004). However, if the beech trees are in a well-frequented area and they have beech bark disease, they should be felled because diseased trees are prone to sudden breakage (McCullough et al. 2005), which makes them a hazard for the public. Treating the bark with an insecticidal soap for scale insects may be a suitable option for ornamental beech trees in public places and on private property. The use of insecticidal soap, combined with removal of the woolly wax using a power washer, will protect the beech and help them resist subsequent attacks by Nectria (Davis and Meyer 2004; McCullough et al. 2005). Insecticide registered for use in Canada: insecticidal soap against the insect. On the other hand, when a tree succumbs to beech bark disease, it is important to prevent the development of root sprouts. Herbicides can be used for this purpose, thereby facilitating the work of foresters (Ostrofsky and McCormack 1986). Herbicides registered for use in Canada: glyphosate and triclopyr. Developing biological control measures for a disease takes a long time and entails a great deal of observation and manipulations. No biological control options are available for beech bark disease at present, but several biologically based factors are under study and some of them look promising. 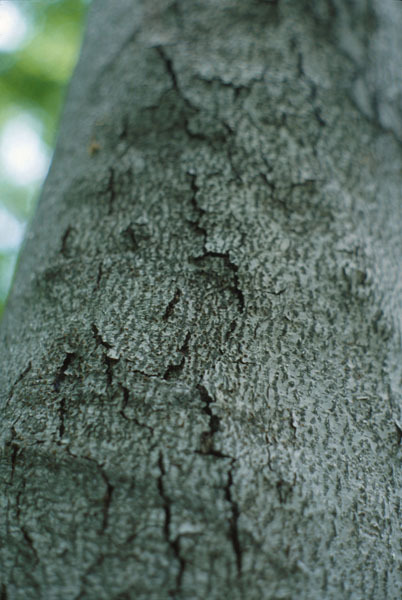 Bark epiphytes appear to increase the resistance of beech by creating a physical barrier to the invasion of scale insects (Houston 1996).At least one parasite of N. faginata is known, Gonotorrhodiella higlei A.L. Smith. This parasite attacks Nectria exclusively and appears to reduce its growth. It is therefore a potential control agent (Ayers 1941; Perrin 1977).There are a few predators that attack the beech scale, including the mite Allothrombium mitchelli. The effect of these mites has been observed in the forest and in-depth laboratory characterization should permit more precise determination of the biological control potential of mites (Wiggins et al. 2001). In the aftermath forest (after beech bark disease dies down), some disease-free or slightly affected American beech may be found, which can be presumed to have some degree of resistance to the disease. All such trees should be retained. They tend to propagate through root sprouts, although their seeds may also germinate and produce healthy trees. 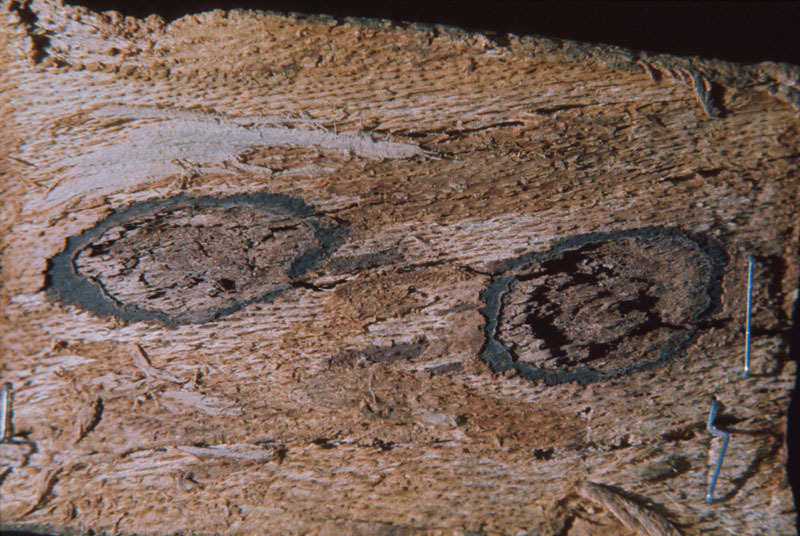 These potentially resistant trees often have smooth bark (Davis and Meyer 2004; McCullough et al. 2005; Heyd 2004). Inspect the stand to determine its general health status. Determine the species composition of the stand, tree density and the size, age and health of the trees. Cut down beech that are in poor condition. Retain trees with a healthy crown and bark. Reduce the number of beech, especially if they are dominant in the overstory. Maintain a buffer zone of trees of other species around less susceptible beech to protect them from stressors. Control root sprouting to reduce the proportion of beech in the stands. Increase tree diversity in the stand by promoting the growth of other species. Reduce the beech scale population by using mechanical and chemical treatments on the trees if warranted by the small number of infested trees. Protect disease-resistant beech and promote their regeneration after the disease has run its course. Ayers, T.T. 1941. 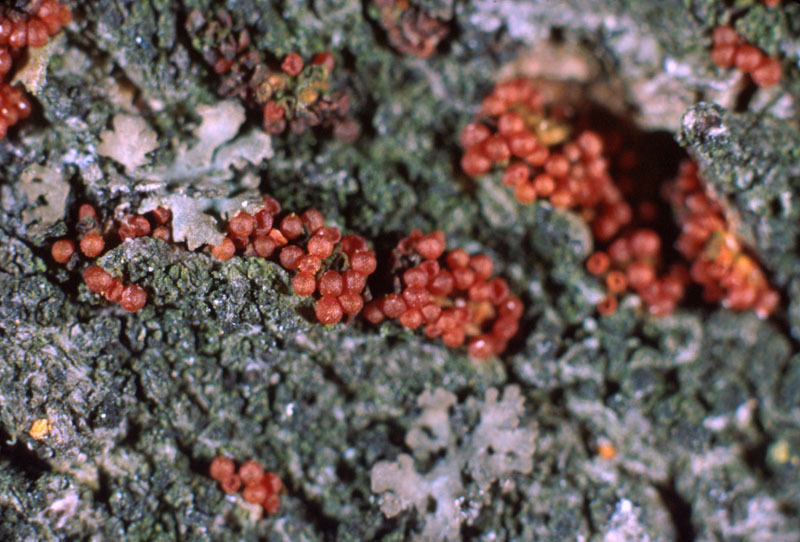 The Distribution and Association of Gonatorrhodiella highlei with Nectria coccinea in the United States. Mycologia 33(2): 178-187. Burns, B.S., and Houston, D.R. 1987. Managing beech bark disease: evaluating defects and reducing losses. North. J. Appl. For. 4(1): 28-33. Davis, C. and Meyer, T. 2004. Field Guide to Tree Diseases of Ontario. Natural Resources Canada, Canadian Forest Service, Great Lakes Forestry centre, Sault Ste. Marie, NODA/NFP Technical report TR-46 (Rev. ed. ), 138 pp. Farrar, A., and Ostrofsky, W.-D. 2006. Dynamics of American beech regeneration 10 years following harvesting in a beech bark disease-affected stand in Maine. North. J. Appl. For. 23(3): 192-196. Heyd, R.L. 2004. Managing Beech Bard Disease in Michigan. Beech Bark Disease. In Proceedings of the Beech Bark Disease Symposium, Saranac Lake, New York, June 2004. USDA Forest Service, Northeastern Research Station, Gen. Techn. Rep. NE-331, pp. 128-137. McCullough, D.G., Heyd, R.L., and O'Brien, J.G. 2005. Biology and Management of Beech Bark Disease: Michigan's Newest Exotic Forest Pest. Extension Bulletin E (2746): 12 pages. Ostrofsky, W.D., and McCormack, M.L., Jr. 1986. Silvicultural management of beech and the beech bark disease. North. J. Appl. For. 3(3): 89-91. Perrin, R. 1977. Gonatorrhodiella higlei A.L. Smith, hyperparasite de Nectria coccinea Pers. ex Fries, un des agents de la maladie du hêtre; Gonatorrhodiella higlei, a hyperparasite of Nectria coccinea, a pathogen of beech. Compte Rendu des Séances de l'Académie d'Agriculture de France 63(1): 67-70. Wiggins, G.J., Grant, J.F., and Welbourn, W.C. 2001. Allothrombium mitchelli (Acari: Trombidiidae) in the Great Smoky Mountains National Park: incidence, seasonality, and predation on beech scale (Homoptera: Eriococcidae). Annals of the Entomological Society of America 94(6): 896-901.